← foray into social media (again)…maybe this time it will stick? I am pleased to announce the newest venue for my work…Liquid Art House has been a huge success. After the sale of my last piece, “Glitter Sisters” I have added two new pieces to be on display at Liquid Art House. 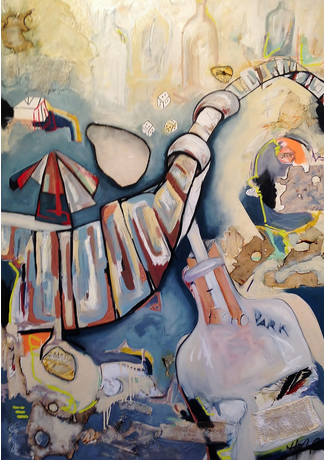 Stop in and check out “Walk With The Moon” 56″ x 40″ Oil and Mixed Media on Canvas, and “Stairs” 48″ x 24″ Oil and Mixed Media on Canvas, while witnessing this truly one-of-a-kind gallery experience! Liquid Art House (L.A.H.) is an innovative gallery-restaurant concept helmed by entrepreneur Ruta Laukien with award-winning chef Rachel Klein balancing art, space and design through the prism of social dining. L.A.H. is designing an interactive “art hospitality” experience—as showroom, gallery, restaurant, lounge and online platform–where all offerings are seamlessly integrated under one roof. Norod’s Paintings “Walk With The Moon” and “Stairs” are currently on view and for sale through Liquid Art House. “Walk With The Moon” is part of of a larger series, titled “Couplings.” This series will ignite questions of our own identity within the relationships we value most. 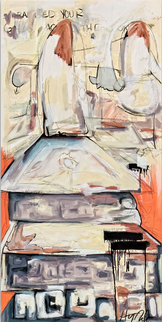 The mixed media paintings developed from an interactive study of couples from familial relationships where a multitude of emotions were expressed and then translated abstractly onto the canvas. “Stairs” is part of her “White Series” paintings that initiated by a challenge. With exception to the black outlines all the colors on the canvas have been mixed with different ratios of white paint. This additive mixture proved the power and depth of color value and materials. In addition to this color experiment the paintings derive from fluid compositions of lyrical imagery.